A balancing pose which requires deep focus in order to hold for a sustained amount of time, and encourages honesty when navigating your way to the fullest expression of the asana that your body will allow you to reach today. With a combination of balancing and twisting; Parivrtta Hasta Padangusthasana does a good job of quietening the mind, while also building strength in the intrinsic muscles of the feet and creating new neural pathways as we focus the mind on the task at hand. To prepare the body for Parivrtta Hasta Padangusthasana; begin by warming up with your surya namaskar A and B sequences. 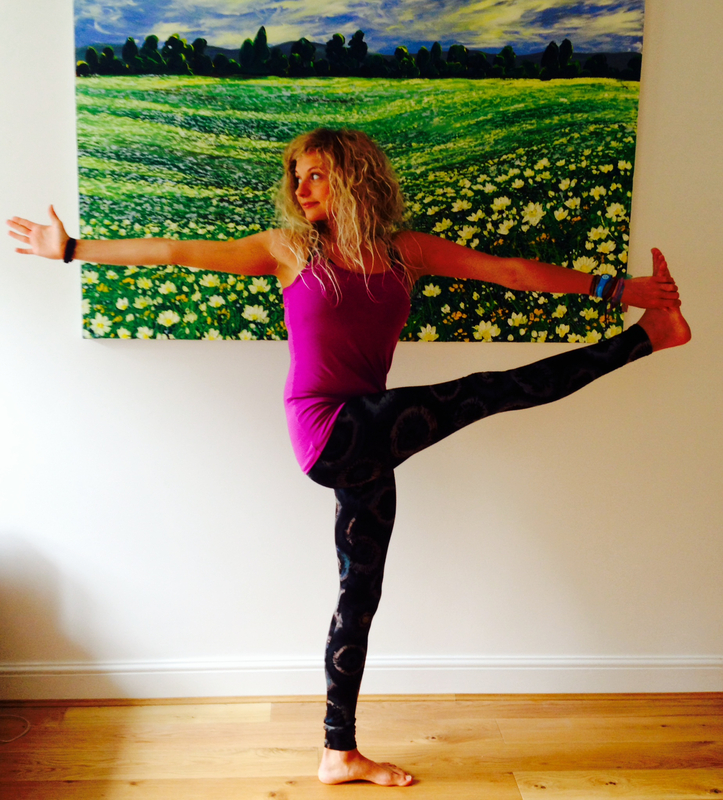 Bring some stability and strength in to the legs with Virabhadrasana 1 and 2, and add in your final Warrior pose – Virabhadrasana 3; to strengthen the feet and ankles and to work on that all-important balance. Lengthen the hamstrings while working on your twisting with Parivrtta Trikonasana (revolved triangle pose), and then move on to Parsvottanasana for more length through the hamstrings. If you’re up for a challenge; practice Parivrtta Ardha Chandrasana to practice the combination of twisting and balancing, while continuing to build strength in the lower body. A great way to find length and stability through the spinal column and therefore keeping the body in healthy alignment is to use the BREATH (super handy here, since we tend to hold our breath in a lot of balancing poses….). Starting from the tailbone; as you inhale, draw up from the tip of the tailbone, through the lower spine, to the middle of the back, allowing the ribs to expand as the lungs fill with breath; continue up through the upper back and the neck. Continue inhaling as you reach up through the crown of the head. Keep the chin slightly tucked to allow the back of the neck to lengthen (Many of us tend to jut the chin out when we attempt to ‘stand up straight’, which means the cervical spine / the neck is not actually lengthened, but instead crunched.) As you exhale, draw back down through the body, reaching all the way down to the tailbone. Continue to do this for a few breaths to allow this length to feel natural and easy in the body. From Tadasana, bring the weight in to the [right] leg, rooting down through the heel, little toe and big toe; and feeling support through your foundation. As you inhale; lift the [left] leg, keeping the knee bent for now. Take the [right] hand to hold the [left] knee while keeping the spine long and the chest open. If you know you have tight hamstrings, you may want to continue from this position, but if you’d like to go further…. Take hold of the big toe of the [left] foot instead of the knee, and begin to extend that [left] leg. *This is where honesty plays an important role in your practice: In our apparent need to reach the fullest expression of every pose – we may sometimes rush in to things without remembering the fundamental principals of why we’re practicing in the first place. The important aspect here is to keep the spine long and the chest open – so as the leg begins to extend, stop when you notice your back starts to round. It is more important to stay lengthened than it is to extend the leg fully or to even hold the foot! When you’ve extended the leg to the length you’re able to today; again re-connect with the firm foundations of the [right] foot and continue to BREATHE! Extend the [left] arm to the side and in line with the shoulder as you begin to exhale and open the upper body to your [left], keeping the extended leg to the front. Once you’ve twisted; again connect back to the breath and hold here for 5-10 breaths, or however many you can manage. (Taking a point of drishti (a point to look at in order to help you focus) will also be handy). To come out: exhale as you return to center and slowly lower the [left] leg to the floor before repeating on the other side. To counterpose the work on the outer hips and the lower body, come to a seated position and take Baddha Konasana to open the inner thighs and hips, and to ‘ground’ yourself after balancing. Be honest, find balance, and have fun!